"I am hurt by the fact that I am going to retire. I do not really want to hear the word 'retire' because I can still run and jump on a bus. It's a (sense of) negativity that I have never experienced before ... I will not stop running, but will do it for my personal health." - 101-year-old marathoner Fauja Singh talking about reitring from racing/competition after his last race this Sunday at the 10k ran alongside the Tokyo Marathon. WTF: Galen Rupp World Leader over 3 distances in 2013!!! How many of your HS graduating class broke 5:00 for the 1600 and how big was it? LRC 2013 ACC, Big 10, Big 12, PAC-12/MPSF, SEC & Heps Men's Conference Previews Isaac Wood previews the men's mid-d and distance action for the five major conferences - ACC, Big 10, Big 12, PAC-12/MPSF, SEC - plus the Heps. *MB: How about some praise for the fact that Oklahoma State has 5 guys who have gone sub-4 in the mile this year? *Why Is The Big Ten Meet In Geneva, Ohio When There Are No Big Ten Schools In Geneva, Ohio? The quick answer is no one wanted to/could host and the new Spire Institute Facility is in Geneva. Big 12: Big 12 Champs Postponed Due To Severe Winter Storm It will now be a Saturday/Sunday meet instead of Friday/Saturday. The Register Guard: "TrackTown Guru Is Crazy Like A Fox: Vin Lananna's Dare-To-Dream-Bigger Tour Continues Unabated" Vin: "I do believe that as crazy, as daunting, as audacious, and really, almost as ridiculous as the World Championship idea is, I don't know what big things happen without being crazy." RunningTimes Interview With Chris O'Hare On taking the lead: "I got passed pretty much straight away again, but that's okay and I'd be pretty mad at myself if I hadn't tried to win it." Chicago Mayor Says They Definitely Won't Bid To Host 2024 Olympics After They Went Out In The First Round When They Made A Bid For 2016 However, other cities such as Miami have expressed potential interest in bidding. 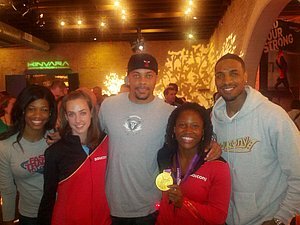 Aries Merritt Signs With Nike He was previously with Reebok. RR: Being Snubbed By UK Olympic Selection Committee Motivated Chris O'Hare To Set The Collegiate Mile Record At Millrose "That's what makes athletes, their disappointments and their lack of success at some point. That's what drives every athlete to their success." Profile On Recent 600m AR Setter, Who Works 30 Hours A Week At A Shoe Store & Only Got Into Millrose After Kevin Borlee Pulled Out Last Minute "I had the opportunity at the Millrose Games, I just needed to put all the pieces together. I love the sport, I love to compete. When you've had success and you still know there's more in the tank, it's hard to step away." Toledo Track Captains Comment On Coach Kevin Hadsell's Resignation And News Reports They said they never witnessed Hadsell drive drunk or give alcohol for minors on the team. Interesting: Former Oregon AD Rick Bay Publishes His Memoirs Mentioning Altercations With Bill Bowerman, Bill Dellinger And Nike Co-Founder Phil Knight He writes of an angry phone conversation with Knight who he said couldn't give the team free gear because it was an NCAA violation. Alysia Montaño Named USATF Athlete Of The Week After Breaking The 600m AR At The Millrose Games "We were waiting to start as Bernard was taking his victory lap. I decided I would run over to Bernard and give him a hug so his American record could rub off on me." Run To Win America 5-K Series Will Pit The 50 States Against Each Other To See Which Is The Fastest All 50 states will hold a race between March 23 and June 1 and the best average finishing time of the top 100 finishers wins. Kenyan XC Team Motivated By Past Success In Bydgoszcz, Poland As They Dominated When The World Champs Were There In 2010 They became the first nation to win all available gold medals – four individual and 4 team titles. Great Race This Weekend: Mo Farah Vs. Martin Lel; Meseret Defar Vs. Kara Goucher Vs. Shalane Flanagan At Rock 'N' Roll New Orleans Martin Lel, Gebre Gebremariam and Markos Geneti were added to the men's field. Last week it was announced Shalane and Kara were taking on Meseret Defar but we missed it with the Oscar P news breaking. Also This Weekend: ThursdayIAAF Preview: Could The 13-Year-Old 2:14.96 1,000m WR Go Down At This Weekend's XL-Galan Meeting In Stockholm Field includes Matt Centrowitz, GB's Michael Rimmer, Mukhtar Mohamed and Andrew Osagie, who all went under 1:47 in Birmingham, Djibouti's Ayanleh Souleiman and Poland's former European 800 champ Marcin Lewandowski. In the 800, Mohamed Aman will take on Abubaker Kaki, Olympic bronze medallist Timothy Kitum and Poland's Adam Kszczot. 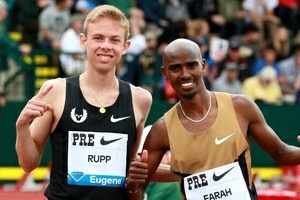 Galen Rupp will go for the AR in the men's 3k as Genzebe Dibaba takes on Abeba Aregawi in the women's. Can Your Town Host The Olympics? USOC Sends Letters To Mayors Of 35 American Cities Asking For Those Interested In Bidding For The 2024 Games The requirements to host include an operating budget of more than $3 billion, 45,000 available hotel rooms, construction of an Olympic Village to house 16,500 athletes, operations space for 15,000 media members, an extensive public transportation network and a work force of 200,000. Good Interview With Hansons Runner Brendan Martin, Who Finished 8th At The Ome 30k In Japan Over The Weekend Talking about the 30k distance, he says it's "challenging in the sense that it's longer than a half marathon but you're running pretty close to half marathon pace for a long time." ESPN3 To Stream SEC Indoor Champs Live Friday Through Sunday Starts at Friday 2 p.m. ET. NCAA Announces 2013 D1 Regional Cross-Country Championship Sites Northeast Region is listed as TBD. Paul Tergat Wants People To Stop Generalizing Kenyan Doping "I do not believe that is the case (widespread use), personally I never come across anyone using them but that is not to say that it does not happen." Bad News: Screw Is Loose In Radcliffe's Foot And She Needs Another Surgery, Which Will Result In 10-12 Weeks Of Crutches "I just want to be able to run and play with my kids," she said. "I'm not even thinking about getting back to running a marathon again." Radcliffe Has High Hopes In Marathon For Mo Farah: 2:04 Is Possible But Will That Be Enough? "I think he will run very, very well, but the depth on the men's side is scary at the moment. He could run a 2hr 04min marathon and there could be 10 people still around him." That Being Said, She Is Baffled By His Decision To "Debut" In The Marathon With 13.1 In London We aren't baffled by it - it's $$$$$imply brilliant. Get paid a ton, raise awareness for the event and learn the course. Good News: NYT: Drug Makers, In Shift, Join Fight Against Doping Roche and GlaxoSmithKline have begun evaluating every new drug candidate for its potential to be abused by athletes and have agreed to share information with WADA. Recommended Read New Yorker: Will Bernard Lagat Live Forever? NY Times Asks: When should you replace your running shoes? Scientists don't know. 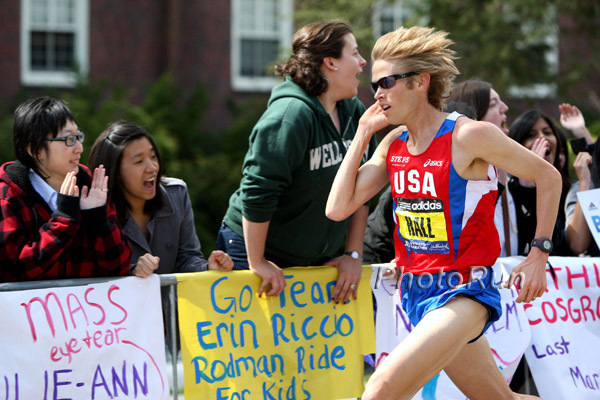 Ryan Hall does every 200 miles. One running store owner - every 2,000. We Respectfully Disagree: Paul Tergat Decries Lack Of Teamwork In Kenya In Year 2013 - Says That's Why They Now Lose World XC Titles "I worried there is no team work nowadays as opposed to our days. That's we sometimes lose the team title." LRC says that Kenya loses as the best guys are all on the road$$$. O'Hare's Collegiate Record Also Was A Scottish Indoor Record The 20-year-old 3:55.43 Scottish record was set by David Strang in 1994. LRC Mo Farah Wins, G. Dibaba Dominates And Michael Rimmer Gets Away With A Foul The British fans got what they want as Mo Farah won as expected, but the distance performance of the night came from Genzebe Dibaba, who won the 1,500 by 7+ seconds. After a trip at the finish line, there was a shock result in the men's 800. Plus world leaders by Natasha Hastings and Murielle Ahoure who beat Shelly-Ann Fraser-Pryce, who ran her 1st-ever indoor race. *Shelly-Ann Fraser-Pryce Pleased With Her Indoor Debut As She Takes 2nd In 60m As Carmelita Jeter Was Well Beaten In 4th Fraser-Pryce: "Will I be back for more, definitely." *Cool Video Of Mo Farah Training And Interviewing In Kenya Talking about the future, he mentions eventually taking a stab at the WRs in the 5,000/10,000. *Based On His Training In Kenya, Paula Radcliffe Thinks Mo Farah Will Do Well At The Marathon Distance "I've seen him attack the long runs out [training] in Kenya and he has all of the ingredients [for success]." *Mo Farah To Run The First Half Of The Virgin London Marathon This Year Yes, half of it. Unusual to say the least, but it can't hurt the TV ratings. Article and video interview with Mo. Arguably the world's greatest marathon men's field got even better. Usain Bolt's 2-Handed Jam Was Highlight Of Friday Night's NBA Celebrity Game Bolt seemingly belongs in the NBA as the refs let him get away with a massive travel but it was impressive nonetheless. Bolt's post-dunk interview was very funny as he claimed he just has a long stride. 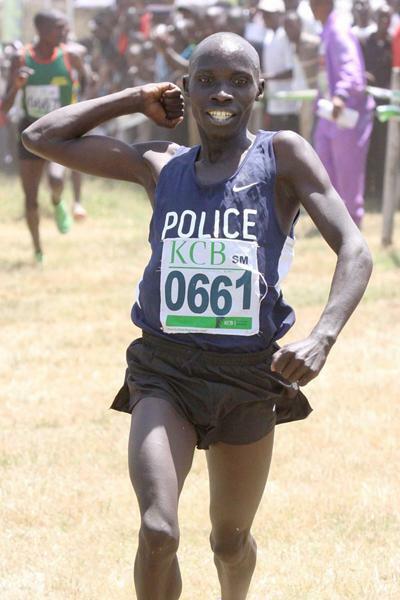 LRC Geoffrey Kipsang: The Total Stud Who Could Win World XC, But Will He Run It? Kipsang is simply on fire right now. Haven't heard of him? Read our article or look below but he's currently the best runner on the planet. Geoffrey Kipsang (58:54) And Lucy Kabuu (66:09) Win 2013 RAK Half Marathon On Record-Setting Day The RAK is now officially the best half marathon on the planet. Ken Nakamura reports that for 1st time ever, 3 nen broke 59:00 in a single race and 4 women broke 67, 6 broke 68 and 10 broke 69. LRC Analysis coming soon. *The Curse Of The Swoosh: Nike Athletes Who Have Faced Scandals *MB: Is Nike the new SI or Madden jinx? 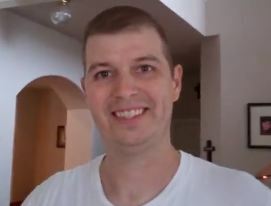 *Alan Abrahmson Reacts To Oscar P: "(He) seemed like one of the world's genuinely nice guys." Previous: Oscar P Shows Up In Court, Sobs - Newspaper Reports Shots Fired Through Bathroom Door The paper that first broke the story, The Beeld (translated from Afrikaans), says the shots were fired through a bathroom door. *Family And Management Team Issues Statement That Dispute Charges In The "Strongest Terms"
*Police Reject Self Defense Theory - Charge Oscar P With Murder The Internet was full of people saying, "Maybe she surprised him on VDay and got shot as he thought she was an intruder at 3 am," but security footages shows she arrived at the house at 8:15 pm. *Not Everyone Has Given Up On Oscar P: Runner's World S. Africa Editor: "I think today everybody has kind of rallied round him." *A Look At Some Of Oscar Pistorius' Alleged Past Incidences Of Drunken And Abusive Behavior Interesting read. *Slain Model Reeva Steenkamp An "Angelic Soul"
Deep Fields Led By Mo Farah And Meseret Defar Set For Sunday's New Orleans Half Farah up against Martin Lel and Gebre Gebremariam while Defar faces Kara Goucher and Shalane Flanagan and World Half champ Berhane Adere. 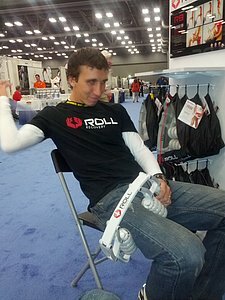 Brett Gotcher Says He's "Hungry To Race Again" At This Weekend's Rock 'N' Roll New Orleans Half Marathon He'll be using it as buildup for the Rotterdam Marathon. A Lot Of Big Races In Japan This Weekend Highlighted By Sunday's Tokyo Marathon Sub-2:05 men Dennis Kipruto, James Kwambai, Dino Sefir and Jonathan Maiyo (Kenya) and sub-2:23 women Irina Mikitenko, Bezunesh Bekele, Aberu Kebede and Caroline Cheptonui Kilel highlight. 101-Year-Old Marathoner Fauja Singh Is Sad To Be Retiring From Competition As He Runs His Last Race (Tokyo Marathon's 10k) This Weekend "I will not stop running, but will do it for my personal health." Thursday Court Case As It Happened No major new developments. The decision on whether or not to grant him bail should be made today. Nike Severs Payment And Suspends Its Endorsement Contract A company statement said: "We believe Oscar Pistorius should be afforded due process and we will continue to monitor the situation closely." Lead Investigator In Pistorius Case Dropped After It Was Revealed That He Faces Seven Charges Of Attempted Murder From 2011 The charges had actually been previously dropped, but were reinstated 10 days before Steenkamp's death. If You Haven't Been Keeping Up, Here Are USA Today's " 10 Most Shocking Facts Of Pistorius' Murder Case" Adding to police "blunders," police didn't take pictures of a box of bullets but managed to snap photos of Pistorius' medals. SA Law Experts Expect Pistorius To Be Released On Bail "You can't come to court and oppose bail for somebody when you yourself are also facing serious charges." Also some interesting comparisons to the OJ Simpson trial. 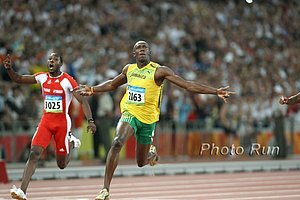 Usain Bolt To Run 150m Race On Brazil's Copacabana Beach Next Month It will be a "street meet" type race on a track built on the beach. Nagoya Women's Marathon Announces Elite Field Japan NR holder Mizuki Noguchi and Georgina Rono (2:21:39) top the list. Article On Why Race Start Times Keep Getting Earlier And How That Affects Performance Times have gotten earlier to go along with local governments not wanting roads closed forever. Unfortunately studies show you run faster in the afternoon, but you can help this by doing hard workouts in the mornings the same time you plan to race. New Study Supports Research On Benefits Of Frequent Breaks From Sitting Study says that you should get up and walk around every 20 minutes and this can lower risk of disease. Ryan Gregson Blogs On His Millrose Games Experience And Dealing With The Huge Time Difference Change Even though he was disappointed with his race, fading badly to 3:55 after going out very quickly, he was happy to find out days later that his en route 1,500 was 3:39.20, which is a new Australian 1,500m indoor record. Pistorius Case As It Happened Wednesday It actually ended up being a bad day for the prosecution, as the lead police investigator was torn apart by the defense attorney on the cross examination. He admitted that there were no signs of a physical struggle on Steenkamp's body and they "found nothing on the scene inconsistent with Pistorius' account." Lead Investigator Admits To A "Series Of Police Blunders" Revelations include he missed a bullet that was left behind in the toilet, potentially contaminating the scene by not wearing proper foot gear and giving inconsistent testimony about how far away the witnesses who hear shouting lived, first saying it was 600m then changing to 300m. 2nd Article With Some Direct Quotes By Prosecutors, Police And Defense Going against Pistorius is the investigator's claim that Pistorius was involved in an accidental shooting in 2009, but let someone else "take the rap." Defense Says That "Steroids" Found In Home Is Actually "Testo Compositum Coenzyme," A Herbal Remedy Which Is Not A Banned Substance The lead inspector said he didn't read the entire label in the dark room and the prosecution seem to have conceded it wasn't testosterone. Police Officer Says They Found Illegally-Possessed .38-Caliber Ammunition In Pistorius' Safe The defence lawyer said it belonged to Pistorius' father. The police also say they found evidence of a house in Italy and offshore accounts which make Pistorius a flight risk. The Telegraph Writer: "Oscar Pistorius Case Highlights How Little We Really Know About The Sports Stars We Idolize" "What fools we are to put such faith in them. The nature of sporting success requires a high degree of narcissism and arrogance, an inflated sense of your own worth, and a single-minded pursuit of your goals. Indeed, it requires many of the qualities that actually work against goodness, kindness and being nice and loyal to the people closest to you." Expert Says "Roid Rage" Unlikely Explanation In Pistorius Shooting "If it was that significant a risk factor for this sort of behavior, you'd have several NFL players a week in court." Steenkamp's Cousin Hopes Pistorius Is Telling The Truth "That is what in my heart that I hope and wish is the truth. Because I would not like to think that my cousin suffered. I don't want to think that she was scared or she was frightened or that she was fearful for her life." Video Interview With Haile Gebrselassie, Who's Training For The Vienna Half And Doesn't Have Any Immediate Plans For A Full Marathon He gives out some advice and says he doesn't advise running your first marathon before 24 or 25 if you want a long career. 33-Year-Old UK Olympic Marathoner Lee Merrien Wants To Continue His Career On To The Rio Olympics After Getting To Run In London After An Appeal Even though he only got in on appeal, he was UK's top marathoner, finishing 30th place. London Mayor Says They're Close To Making Deal With West Ham United On Taking Over Olympic Stadium They've been saying this for months, but maybe they actually mean it this time as they want to host 2015 Rugby World Cup games at the stadium, but need this deal squared away before the end of March in order to make it work. Oscar Outlines His Case: The Full Affidavit He claims he was on the balcony, heard a noise in the bathroom, though it was an intruder, got his gun, hobbled into the bathroom on his stumps and started firing into the locked bathroom door. He has an explanation for the bloodied cricket bat as well. Discuss: How Oscar's story could hold water, or not, your theories. Prosecutors Respond - Pistorius Killed His Girlfriend "In Cold Blood" Pistorius put on his artificial legs and walked across his bedroom before firing four shots through a locked toilet door, killing his cowering girlfriend in cold blood." More From Prosecutors "There is no possible explanation to support his report that he thought that it was a burglar. Even (in) his own version, he readied himself, walked to the bathroom with the clear intention and plan to kill the 'burglar' and did so whilst the burglar was harmless and contained in a toilet. This in itself also constitutes premeditated murder of a 'defenceless burglar.'" Steenkamp's Mother Speaks To The Press: "Why did he do this?" Law Expert Says With Murder Cases, The Number Of Convictions In South African Courts Is "Staggeringly Low" He estimated that fewer than 10% of murder cases end in conviction. BBC Apologizes After One Of Its Radio Stations Followed A Report About Pistorius With A Song About A Man Shooting His Girlfriend They played Jimi Hendrix's "Hey Joe." What?!? Athletics Gauteng North Name Oscar Pistorius The Male Track & Field Athlete Of The Year Pistorius wasn't able to attend the award ceremony Saturday night as he was in jail. "SA's Violent History Makes Pistorius Case Grimmer"
UK Names Their Team For Euro Champs - Paula Says It's "Totally Ridiculous"
Paula Radcliffe Criticizes Team GB Coach Peter Eriksson's Roster Decisions For European Champs, Tweeting That It Was "Totally Ridiculous" She was unhappy that they decided not to take any male 1,500m runners, despite having 3 who hit the qualifying standard, including Chris O'Hare, who set the indoor collegiate mile record at Millrose. Eriksson Defends 1,500 Decision Saying They Were Only Bringing Runners Who Had "Top 6 Potential"
PV WR Holder Yelena Isinbayeva Says She Doubts She Will Be Fit Enough To Compete At Moscow World Champs She knows they're not until August, right? Spikes-Mag Names The 5 Athletics Events They'd Add To The Olympics DMR and Cross-Country top the list. 16-Year-Old Aussie Runs 2:04.68 800 She broke a 44-year-old under-20 MR held by Cheryl Peasley, who went on to win a Commonwealth Games medal. Stunning Live Updates Here: Oscar P. Uses Disability As Key Part Of His Defense "I woke up in the summer heat, went out on the patio on my stumps to get a fan, heard a noise in the bathroom and thought there was an intruder as I knew the window was open and ladders were accessible nearby. 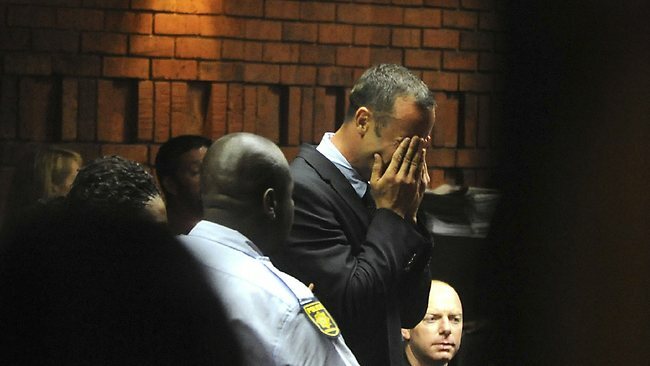 I felt extremely vulnerable (as I was on my stumps) but I knew I had to protect Reeva and myself." *MB: Discuss Live Updates Here: Wow: Oscar P's sobbing was so good the judge stopped the proceedings: "My compassion as a human being does not allow me to just sit here." Latest Theory: Did Text Message Or Tweet To/From Rugby Player Francois Hougaard Set Oscar P Off Into Murder-Filled Rage? Good Read Q&A About What To Expect At Tuesday's Court Hearing (Most Of You Will Be Asleep When This Happens) Interesting to learn there are zero jury trials in SA and thus they aren't too worried about the media links as judges are less influenced by that. He's most likely to spend at least 25 years in prison if convicted. *Pics Of Pistorius Crying In Court Violated A Judge's Order - Won't Happen Again Audio tape recordings are allowed but only before and after photos. *Agent: Oscar Pistorius Has Received "Overwhelming Support" The agent also realizes he's personally likely to lose a ton of dollars potentially. "Obviously from a management side and also as a friend, it's a tragic circumstance." Steroids Reportedly Found In Oscar's Home Should we really be surprised? If any top athlete gets busted these days, we don't think you should be surprised. *Distraught Oscar P Called His Best Friend After Shooting Before Police Oscar P reportedly said, "My baba (baby), I've killed my baba (baby). God take me away." *Sky News And NBC Setting Up Shop Outside Of Oscar's Jail "He is about the only Olympic person they [Brits] know that isn't British apart from Usain Bolt." *Dream Legal Teams Set To Square Off The Prosecutor is pretty famous in S. Africa and Oscar has a top notch lawyer and a great PR team. *World XC Junior Champ Faith Chepng'etich Wins Kenyan Trials; Mercy Cherono's Younger Sister Caroline Chepkoech Was 4th Kwemoi Ronald was the winner of the boys junior race over a field that included sub-27 10ker Emmanuel Bett (a different Bett than the sub-27 10ker) and World Junior steeple champion Conseslus Kipruto. LRC Geoffrey Kipsang: The Total Stud Who Could Win World XC, But Will He Run It? Kipsang is simply on fire right now. Haven't heard of him? Read our article or look below, but he's currently the best runner on the planet. Spanish Steepler Marta Domínguez Linked To Doping Doctor Eufemiano Fuentes There were multiple documents making it pretty clear that she received EPO treatments and blood transfusions. Study Says 14% Of Track Athletes At Daegu WC's Blood Doped: WADA Director General David Howman Says Doping Problem Is Getting "Bigger And More Serious" And "Too Big For Sport To Manage" He blames sports federations for only doing the bare minimum as he said, "Where's the commitment here? We spend all the money and put everything in place. What we've discovered in the last number of years is that unless we make something mandatory, people won't do it. If it's discretionary, they think they don't have to bother." IOC Calls For Conference With WADA To Try To Ease Growing Tensions Between WADA And Several Sports Obviously cycling is the big one. S. African Paper Exclusive: The Case Against Oscar A bloodied cricket bat has been found. Oscar called his parents after gunning down his girlfriend. Prosectuors reportedly have a "rock-solid" case against Oscar. Police are testing his blood for drugs and steroids, anticipating a "roid rage" defense. 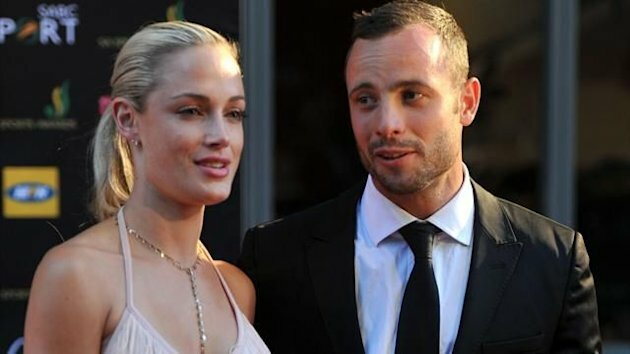 Oscar Pistorius Reportedly Tried To Resuscitate His Girlfriend After He Shot Her Reports in Afrikaans-language newspaper Beeld said he carried her down the stairs and tried to resuscitate her. Oscar Pistorius' Agent Says Oscar Has Received "Overwhelming Support" Form His Fans His agent visited him in prison to discus his track career/state of his sponsorships. All his future races have been cancelled. Pistorius Trial Cartoon: ""If he gets off it'll be the closest shave anyone's ever had with two blades"
Oscar's Uncle Defends Him: "We have no doubt there is no substance to the allegation and that the state's own case, including its own forensic evidence, strongly refutes any possibility of a premeditated murder or murder as such." Interesting Read: Radio Journalist David O'Sullivan Compares The Polite, Unassuming Oscar Pistorius He First Met At 17 To The One Today Apparently Pistorius' roommate at the Paralympics had to move out because Oscar "was constantly screaming in anger at people on the phone." Usain Bolt Reacts: "When I heard, I was in shock and I'm still just trying to process it in my head to see if this is really real." Pistorius' Agent Has Started Cancelling His Scheduled Races For The Year 9 races cancelled in total. 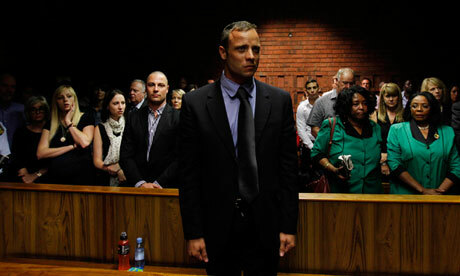 Sarah Britten Of Johannesburg's Mail & Guardian: "Oscar was our good thing ... He was a great South African brand and now his story, and our part of it lies in tatters." 7:54 Steepler Paul Kipsiele Koech Wins Val de Reuil 3,000 In 7:38 At Jesse Owens' Stadium Tuesday Night Other action included Olympic steeple silver medalist Mahiedine Mekhissi-Benabbad losing in the 1,500 to Morocco's Abdelaati Iguider, who won with 3:38.24, and US's Mike Rodgers beating out former 100m World champ Kim Collins in the 60m. US's Ryan Whiting Dominates Shot Put In Pedro's Cup Meet In Bydgoszcz, Poland There was top competition as Germany's two Olympic medallists Bjorn Otto and Raphael Holzdeppe faced off with Otto winning easily as Holzdeppe no-heighted. For the women, Olympic silver medallist Yarisley Silva won over Great Britain's 2013 world leader Holly Bleasdale. Wilson Kipsang Thinks The WR May Go Down At This Spring's London Marathon And Says He Considers Patrick Makau And Geoffrey Mutai His Biggest Rivals On coming so close to breaking the WR in Frankfurt: "When I see Patrick I always joke with him: 'was it three or four seconds?'" First Anniversary Of London Games To Be Marked By Three Days Of Track In The Olympic Stadium Will begin with two days of the Diamond League on July 26-27 followed by a day of Paralympic events on July 28. 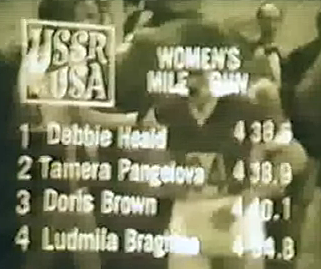 Athletics Weekly Tribute To Rita Ridley, One Of GB's Greatest Distance Runners, Who Died From Cancer Earlier This Week She was the 1970 Commonwealth Games 1,500m champion. Lance Armstrong's Olympic Medal Won't Be Reassigned The IOC asked Armstrong to hand back the his 2000 Sydney Games bronze after he confessed on Oprah. No word if he gave it back yet. IAAF President Lamine Diack Hails Deceased Jamaican T&F Administrator Neville "Teddy" McCook As A "Passionate Servant" & "Tireless Administrator"
+1 For Australia: Aussie Olympic Committee Requiring All Its Athletes To Sign "Statutory Declarations" Saying They Have Never Doped The AOC warned, "Any person who wilfully and corruptly makes a false statutory declaration knowing it to be untrue will be guilty of a criminal offence and could face up to 5 years imprisonment." Good Cycling Read: WADA President John Fahey Says They Will Conduct An Independent Inquiry Into Cycling If The UCI Agrees To Stay Out Of It Fahey: "Cycling seems to be constantly lurching from crisis to crisis and the UCI must fix that for the good of the sport and everyone that enjoys it." WADA Says China Produces The Most Raw Doping Materials "Ninety-nine percent of the raw materials that are used through the internet to make up in your kitchen or your backyard laboratory are emanating from China." Bolt: "I felt a bit nervous. I just came out here to win and I'm glad I won injury free." Blake said, "I'm happy with the run, despite the time. I'm just looking forward to the rest of the season." *Warren Weir: "Speed endurance for me is one of the main things because you can be very fast in the 200m, but if you don't have speed endurance, you won't do well ..."
Milo Western Relays: Asafa Powell And Nesta Carter Lead Their MVP 4 X 1 Team To Victory With 38.06 Shelly-Ann Fraser-Pryce led the MVP women's 4 x 1 team to a win with 44.03. *Interesting Article On What Asafa Powell Is Up To Outside Of Track And What He Wants To Do When He Retires He collects expensive cars, invests in real estate, has started an online shopping company and has his own clothing line called "Sub-10 King." Full US Squads For World XC Champs Announced Chris Derrick and Matt Tegenkamp are running, but no Ritz. Kenyan Junior XC Champ Ronald Kwemoi' Turned To Running After He Had To Quit School Since His Parents Couldn't Afford To Send Him Even though he comes from poverty, money isn't his focus: "I'm not in the sport for money since I love running." IAAF Launches "IAAF Inside Athletics" Social Media Program To Focus On Different Topics In The Sport And they couldn't have found a better host as they chose Ato Boldon to lead the analysis. Watch Episode 1 where Boldon analyzes Usain Bolt's 9.58 100m WR and who, if anyone, is capable of breaking it. Lance Armstrong Refuses To Participate In USADA Interview And Be Interviewed Under Oath His lawyer said he wants to participate in and "international tribunal", not with USADA. USADA Says It Will Move Forward With Their Investigation Without Armstrong Travis Tygart says Armstrong won't talk to them because he is "worried of potential criminal and civil liability if he did so." Tyler Hamilton Tells Court He Was Once Re-Infused With His Own Blood By Cyclist With No Medical Training He also talks of how he was accidentally infused with someone else's blood (which is why he failed a doping test in 2004 and spoke about a bad reaction to one which left him feverish and passing black urine. TWTW The 2013 Millrose Games, The 2013 London Marathon and Can The USA Win World Cross-Country? This week, we praise Mary Cain for her great tactics, give props to the amazing collegiate milers, including the unheralded Ryan Hill, talk about Bumbalough over Jager (again), tell you that Centro does get tired, wonder if it’s time to panic for Robby Andrews, and tell you that the performance of the weekend came from Alyisa Montaño. We then start to salivate as to how incredible the 2013 Virgin London Marathon is going to be and ask the unthinkable - can the US beat Kenya at World Cross-Country? Plus will Marta Dominguez ever be busted for being a doper? And google kills off Mary Cain. People Who Think Armstrong Was On A "Level Playing Field" Or Say Doping Should Be Legal Need To Consider This: Tyler Hamilton Says He Paid Doctor In Operation Puerto Scandal $33,000+ For Doping That was just for 2002 and 2003. If everyone dopes, it doesn't make it a level playing field; it just comes down to who has the most money and best science. LRC Kevin Hadsell Denies The Deadspin Allegations - "Yeah I'm an idiot for a lot of things here, but these things don't add up to me being some monster - people didn't come forward with this kind of crazy stuff in the Deadspin article because those things weren't happening." Over the course of two hours with the Toledo NBC affiliate, Hadsell admits he deserved to be let go from Toledo as he drank at practice and previously had an inappropriate relationship but denies the salacious aspects of the Deadspin.com article. London 10k Olympian Mika Yoshikawa To Retire After Marathon Debut At Tokyo To Focus On Having A Family She's only 28. 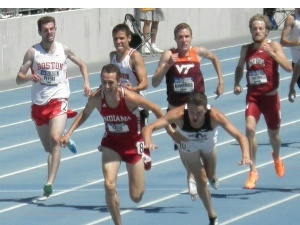 Cory Leslie Wins Virginia Tech 1,000 In 2:19.83 Jeff See won the mile in 3:58.36. Ridiculous: 2 Weeks After Running 2:08:15 To Win The Beppu-Oita Mainichi Marathon Yuki Kawauchi Wins Hilly Kumanichi 30K In 1:29:31 (4:48 pace) He won by 3 seconds, setting a 36-second PR. Elsewhere, Masaki Ito won the Ome 30k in 1:30:21 as Hansons runner Brendan Martin was 8th in 1:36:07. Yuki Kawauchi: "You used to be able to say that I didn't have any speed, but ... I think I've cracked that nut. 2:06 Is in sight." NY Times: How Would You Feel If You Had The "Livestrong" Wristband Tattooed On Your Wrist? Well Said: Ken Goe: Throwing rocks at the state of track & field journalism is easier than being part of the solution We see what Kevin Liao was trying to say and liked his piece, but "mainstream journalists" didn't bring down Bonds, Jones, Lance or even Bill Clinton. Prosecutors/bloggers did. Chris Kelsall Catches Up With Olympic Marathon Champ Stephen Kiprotich It's clear from this interview he loves his coach Patrick Sang and his life has been changed big time. He's sent his wife back to school." One Who Stayed: CU Alum And 29:10 Guy Andy Wacker Is Balancing Grad School/Training With Wetmore He was a surprise 11th at USA XC. LRC Learn About Altra Zero Drop: The Shoe Company Started By A Foot Locker Finalist (With Alan Webb And Ritz) Who Ran A 2:45 Marathon At Age 12 LRC visitor's love the underdog and one of our goals starting off the new year is to introduce you to some of the newer shoe companies. Altra Zero Drop is a relatively new company, growing fast. Perhaps you've seen their ESPN commercial? Click here for more info. A Interesting Read Rojo's "No Question Goes Unanswered" Interview With Women's Running Website - Saltyrunning.com This is a great read as Rojo goes back to the beginning and shares the co-founders vision for the site. He is unfazed when asked if LRC is "elitist, anti-hobbyjogger, and anti-women," he reveals the secrets as to how the site is made each day, and he defends the no registration policy of the message boards. LRC The Week That Was: A Bunch Of Nick Symmonds, The Nike .1% Solution, LRC Goes To Japan, And Much More This week we wonder, "Can Nick Symmonds really move up to the 1,500? ", LetsRun.com goes to Japan, JK is confirmed to be a genius (yet again), and we wish that Nike would sponsor a "Just Do It Fairly" campaign. Along the way there is talk of Matt Tegenkamp, Dathan Ritzenhein, Al Sal, Mary Cain, Galen Rupp, German Fernandez, Robby Andrews, Leo, Centro, Wheating, Tyson Gay, Dorian Ulrey, Rich Kenah, Sam Mackenzie and Nick Wade.